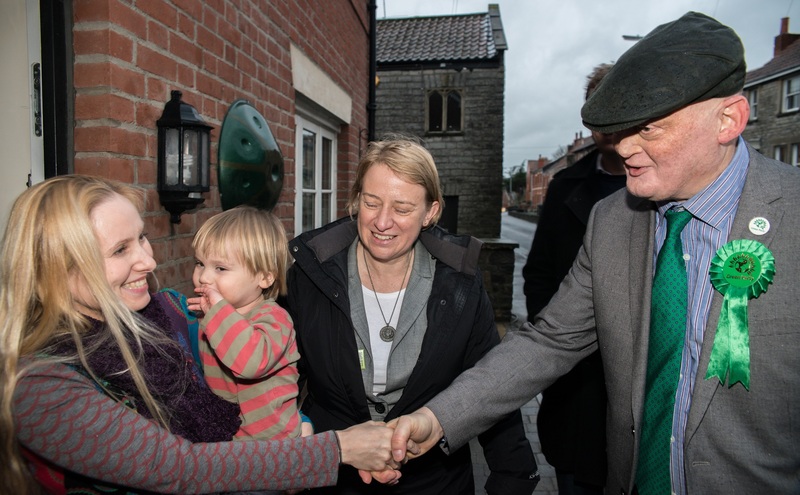 When Green Party leader, Natalie Bennett visited Glastonbury on 26th January, not only did she meet with the Last Bank Standing Campaign, but she also wanted to learn more about ‘Lighten the Load A361’; to hear from residents about the impact of heavy traffic on their lives, and to witness the situation first-hand. As a result of Green Councillors’ involvement with Lighten the Load – and the creation of the Town Council’s A361 Committee – Natalie was familiar with the petition to remove Glastonbury from the Freight Network; to stop HGVs from travelling through the town. From reading reports by Glastonbury’s Green Cllr Lindsay MacDougall, Natalie already understood something of the problems facing local residents who live along the A361. However, she welcomed the opportunity to experience the situation in person – and was visibly shocked at the close proximity of the traffic to pedestrians, the lack of safe crossing places, and the narrow width of the road as it squeezes through Chilkwell Street by Chalice Well. Natalie listened in amazement to hear that Somerset County Council will not fund traffic surveys, decibel, pollution, and vibration testing for Glastonbury! She was also surprised to hear that the County’s Highway department have repeatedly failed to meet with Glastonbury Town Council to discuss the issues! She was deeply concerned to meet a family with young children whose front door opened directly onto the road’s edge – the danger being obvious. Natalie and Paul Lund meet a family with young children whose front door opens directly onto the road’s edge!